Senator Len Fasano meets with Lauralyn Lewis, Director of Advocacy for CT DDS Families First, and her son Justin Moore. 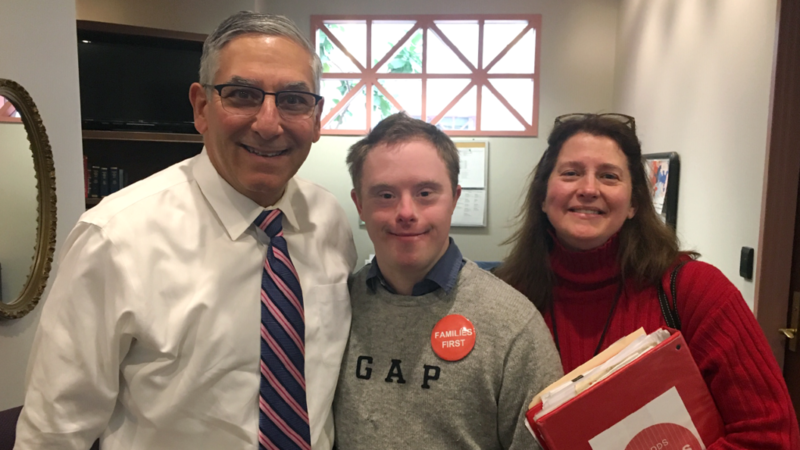 Last week Senator Len Fasano (R-North Haven) joined advocates and families urging lawmakers to support policies that help individuals with intellectual and developmental disabilities (I/DD). Sen. Fasano met with families at the 6th Annual I/DD Family Hearing Day which took place on Monday, February 25, 2019. The annual event gives people with intellectual and developmental disabilities and their families the opportunity to speak directly to legislators about the challenges they face. Sen. Fasano also submitted testimony in support of three legislative proposals aimed at helping those with intellectual and developmental disabilities and supporting the family members who care for them. Sen. Fasano explained in his testimony that he proposed these three bills after listening to input from families and advocates. Senate Bill 367 AN ACT ESTABLISHING A TASK FORCE ON THE NEEDS OF PERSONS WITH INTELLECTUAL DISABILITY. Senate Bill 372 AN ACT CONCERNING THE PROVISION OF RESOURCES TO GUARDIANS OF ADULT CHILDREN WITH INTELLECTUAL DISABILITY. Senate Bill 393 AN ACT CONCERNING THE DEPARTMENT OF DEVELOPMENTAL SERVICES’ LEVEL OF NEED ASSESSMENT.